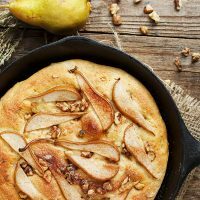 This Pear and Walnut Focaccia is best served with a drizzle of honey, some gorgonzola cheese and a glass of white wine. This focaccia is ever-so-slightly sweet. Not enough to resemble dessert, but enough to really bring out the best in the pears. A bit of thyme and some walnuts bring extra flavours to each bite. If you don’t bake a lot of bread, you may not be familiar with making a “Sponge”. It’s really just a small bit of dough that gets a head start fermenting. It’s typically very moist and batter-like, so it get’s going really easily. You can make this focaccia as either one large (12×17-inch-ish) focaccia or as two 8-9-inch rounds, as I did in my cast iron skillet. If you’d like to make two rounds and only have one skillet, just bake them off one after the other. I froze the extra one. Enjoy this focaccia on it’s own, or try it with a drizzle of honey and/or some gorgonzola or blue cheese. This focaccia is best enjoyed right after it’s baked. If you have some left-overs, it can be frozen and enjoyed later or try popping it under the broiler with a little gorgonzola on top. 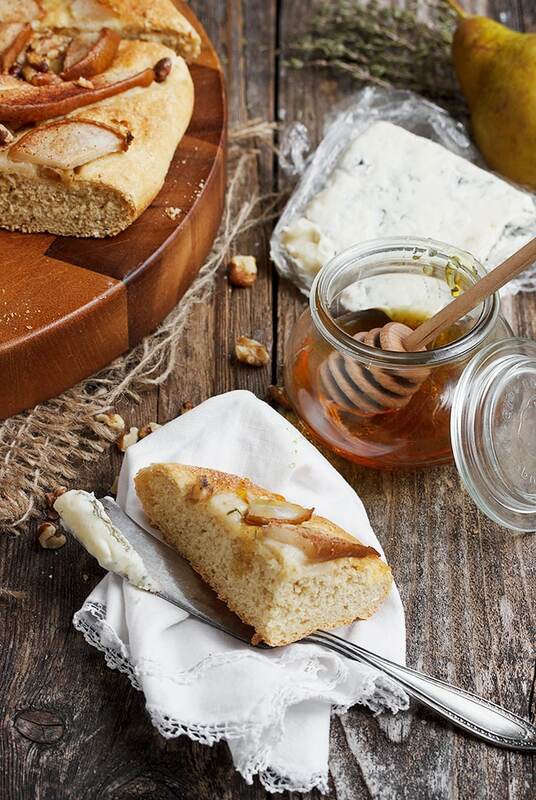 A slightly sweet focaccia, best enjoyed with some gorgonzola and a glass of white wine. Best enjoyed right after it's baked. Make one large 12x17 focaccia or two 8-inch round focaccia. Make the sponge: In a large bowl or the bowl of a stand mixer, combine the yeast and water and stir to dissolve. Whisk in the sugar and flour. Cover with plastic wrap and let proof in a warm place until bubbly and doubled in volume, about 45 minutes. Make the dough: If using a stand mixer, whisk together yeast and water in a small bowl and let stand a few minutes until creamy. Add to sponge mixture in the mixer bowl with the brown sugar, molasses and vegetable oil. Add the cornmeal and salt and mix in with the paddle attachment for 1 to 2 minutes, until ingredients are well combined. Add 2 cups of the flour. 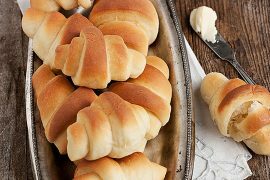 Change to the dough hook and knead on medium speed for 8 to 10 minutes, adding more flour in 1/4 cup increments, as necessary, until dough comes together and slaps against the sides of the bowl. It will be slightly tacky. Remove dough to a greased bowl and cover tightly with plastic wrap. Let dough rise in a warm spot until doubled, about 1 1/2 hours. Line a baking sheet with parchment paper and spray with cooking spray. Turn dough onto the baking sheet. Oil or moisten your hands, and press out dough until it just about covers the bottom of the pan. Dough may be sticky. Cover with a damp towel and let rise in a warm spot for 45 minutes to an hour, or until dough is full of air bubbles. Preheat oven to 425° F. With lightly oiled fingertips or with your knuckles, dimple the dough, pressing down hard so you leave indentations. Place walnut pieces in the indentations, then sprinkle the thyme evenly over the dough. Arrange pears evenly over dough. Combine the white sugar and cinnamon, then sprinkle the cinnamon sugar mixture evenly over pears and dough. Bake 20 to 25 minutes, until edges are crisp and top is golden. If you wish, remove focaccia from the pan and bake directly on the stone during the last 10 minutes. Remove from oven, remove from pan at once and cool on a rack. If you want a softer focaccia, cover with a towel when you remove it from the oven. Serve warm or at room temperature. Best enjoyed right after it's baked. If you have some left, you can pop it under the broiler to crisp up. Try melting some cheese on top! Yum, I love focaccia and this sounds like a great variation! This is so beautiful! I’m loving those gorgeous pears on top! Can’t believe I’ve never made focaccia. Thanks Karen :) Focaccia is one of my favourites and it really is easy to make and endlessly customizable! Thanks :) I hope you get a chance, Shareba. Focaccia is a very easy bread to make and endlessly customizable! This looks great, and I love the slice of pear with the stem still on! I just made a bread with an overnight sponge for the first time this past week, so funny that you mention it here! Gorgeous focaccia and I can’t wait to try it! Thanks Liz. I think breads that start with a sponge have the best flavour! Wow! I have never tried to make foccaccia, but I love eating it. The combination of the pears, nuts, and cheese sounds so good! Thanks Jessie. I love making focaccia. Quick and easy and always good! Dang, looks so good! Elegant too :) Oh I just love fruit and nuts on bread…. I am thinking that the leftovers would make a great grilled cheese with parmesan and fruit preserves! Maybe?? WOW! I love this beautiful bread! 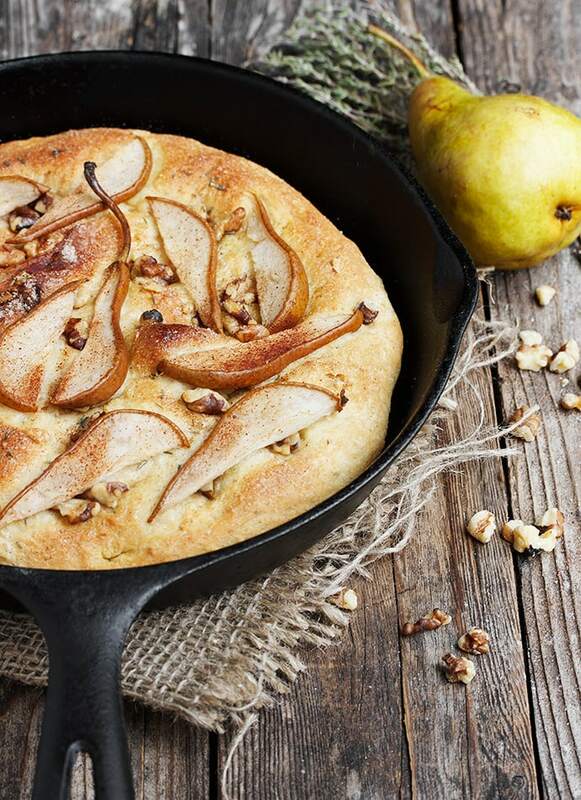 And I just love how you baked it in a skillet – this would be my favourite dinner! Don’t mind me while I lick the screen :) This focaccia is gorgeous and I love all the beautiful fall flavors. I bet it tastes amazing! 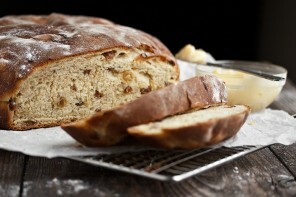 This bread looks gorgeous! I love the combination of pear and a touch thyme! Lovely. 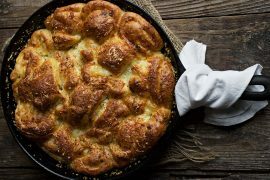 Such a gorgeous focaccia, love that you baked it in a skillet! This might be the most delicious recipe I’ve seen all week! I make a lot of focaccia, but it’s always just rosemary. 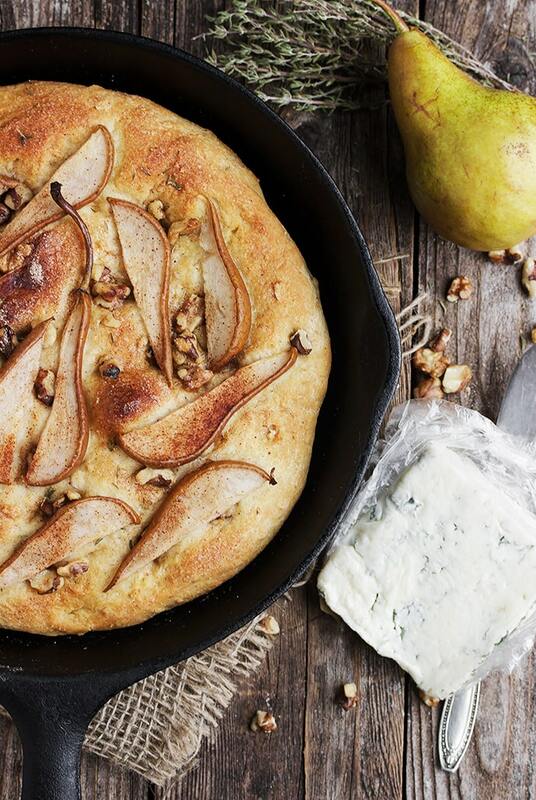 The pears and walnuts, plus a little gorgonzola on the side sounds incredible Jennifer! Thanks Jessica. Couldn’t resist baking with some pears. They are so nice right now! Absolutely gorgeous. I’m going to my grandmother’s next weekend, and this seems like the perfect treat to nosh on. Sending recipe to her now! Thanks Sarah. I loved the pears and walnuts on this one. This looks heavenly! I think I am going to serve this as an appetizer for my bday dinner this weekend – there will be lots of white wine there anyway ;) YUM! 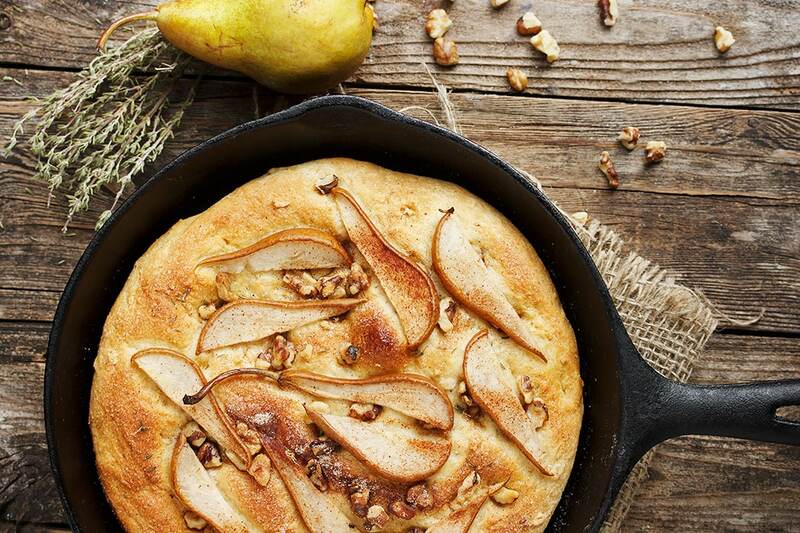 I love the looks of those big pears on top of this focaccia. What a perfect fall snack! Thanks Katrina. It was delicious!